A black and white negative of Lorne Coe dressed in Composite Lodge attire. Lorne Earle Coe was born at Montreal, Quebec, on 5 October 1949, and lived on the south shore of the St. Lawrence River at Montreal until he was 16. In 1965 he went to Ottawa, and then to Brampton and Bramalea, Ontario. In 1983 he came to Whitby where he was director of the community and public affairs division of the Worker's Compensation Board of Ontario. Mr. Coe served on the Whitby Town Council as East Ward Councillor from 2003 to 2010 and as a Durham Regional Councillor from 2010 to 2016. In 2016 Mr. Coe ran as a Progressive Conservative candidate in a Provincial by-election for the riding of Whitby-Oshawa and was elected as MPP. 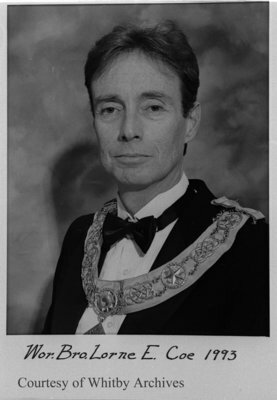 Lorne Coe was a member of Composite Masonic Lodge Whitby, (Master, 1993-1994), a member of Whitby Sunrise Rotary Club, and a director of the Whitby Chamber of Commerce. Lorne Earle Coe, 1992, Photographer Unknown. Whitby Archives A2016_017_014A.